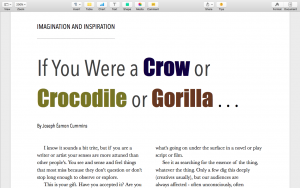 Imagination and Inspiration: If You Were a Crow or Crocodile or Gorilla . . .
You’re probably a ‘something’ first – carpenter, teacher, website developer, insurance clerk, fashion model. But you are also a creative person, even if you think you’re not. Maybe you’re an aspiring novelist or poet or an artist on one kind or another. Or perhaps not, but you see yourself as open-minded, a liberal thinker, or just someone who is definitely not ‘stuck in the mud’. If you are any of these things, here’s a question for you: How much time do you give to exploiting your inspiration and imagination potential? I mean give to developing both of these tools of achievement – inspiration and imagination – for getting things done, or done better. Or is imagination something you take for granted and inspiration something you wait for? Just ‘automatic magic’ that bears no thinking about? Every time I sit down to write about human behaviour I note again the mental kinship between the process of creating – especially when creating for an audience – and psychology. Here’s the point: Imagination and inspiration can be spiked up – and exploited beneficially – through conscious effort. Just like the skills of grammar or computation, which, by the way, you had to learn and refine before they paid you back. But when was the last time you were offered a course in Imagination or Inspiration? And the last time you sought one? Man does not achieve by grammar or computation alone, nor artist by honesty or talent alone, nor worker by education or dedication or sweat alone. If you are foolish enough to ignore imagination and inspiration, to wait for automatic magic, your best will always be beyond your reach. This article gives you a few basic techniques you can employ confidently to make sure the ‘arty crowd’ don’t leave you in the dust. If You Were a Crow or Crocodile or Gorilla . . . I know, a curious title, it sounds more like a bedtime story, but then you are reading this, aren’t you? I wonder why. Perhaps because two imaginations are at work – yours and mine. Orchestrated by the writer! Some might say manipulated. Others would say art. No difference. But that’s not the whole story. You have more going for you. Let’s assume here that you’re a writer, artist or ‘creative’ of some kind, in which case your senses are more attuned than other people’s. You see and sense and feel things that others miss because they don’t question or don’t stop long enough to observe or explore or ‘play’. This is your gift. Have you accepted it? Are you applying it? Are you milking it? Not consistently, I’d bet. Or not consistently enough. Time to recommit to your gift? Because your mind is both an instigator (it creates) and a processor of (it packages) inspiration. That sparkling idea you are hoping for can originate entirely within your imagination, obviously, but it might also originate via your senses – something you see or hear or touch or taste or experience. However it’s conceived, the embryonic idea will need to be nurtured by your imagination into a scene, a short story, a book, a painting, a piece of sculpture or music, or even how you might portray a stage character. This is processing, the imagination at work. Exploit it relentlessly! If you were a crow or crocodile or gorilla you wouldn’t have it. Exploit it how, you ask? Explore deeply the ‘ordinary’ things, unlock the core elements others miss. By digging. Note the peculiar way one person looks at another, the language someone uses that fails to hide contempt, the way the stranger’s face reconfigured when her hand touched his cheek, how precisely the woman back-pedalled when the door burst open, and so on. Search for it in the subtext you detect or imagine in a scene, a character, what’s going on under the surface in a novel or play-script or film. See this as searching out the essence of the thing, whatever the thing. Few dig these depths (creatives excepted, of course) but our audiences are always affected – often unconsciously, often profoundly – by the essences we find and present or even hint at in our work. So, let’s recap. Successful creatives are observers, keen observers, which is key. When you are calling for inspiration, observe closely that ‘thing’, turn it upside down, transpose it, get inside it, if inanimate bring it to life, ask countless what-ifs, get childlike with it, get silly. ‘Silly’ is simply a word. Playing in your imagination is anything but silly – geniuses do it all the time! Try to capture the essence of what your mind and senses are experiencing – and here’s the unmissable point: do it even when you feel you’ll never use what you discover! As writers and artists we feed our imaginations constantly, with words and images and ideas and their associated emotions. Much of this goes nowhere, or it seems that way. But these pulses of thought, the words and images and ideas and associated emotions, are the raw material of inspiration. I say ‘raw’ because typically they arrive brief and undeveloped, a spark rather than a circuit; their inherent value needs be explored, chiseled into shape, and exploited, because great and even good ideas are rarely born fully clothed. In my new novel On the Edge of the Loch, no more than 20% of what I wrote made it into the published book (110k words). Was the unused 80% a waste of effort? Just the opposite! Those unused words and ideas had to be written to get to what hid inside the marble. You’ve heard the tale of the old lady who asked the museum guide how Michelangelo knew that David was inside the block. Contrary to what you might think, that’s a good question. How so? Perhaps you’ll find the answer in your own thinking – if not, in this article, or a fusion of both. Dwell long on that answer. For life is not easy for writer or artist of any stripe, in any era. And few non-artists truly appreciate this. Even fewer know that – despite your talent, despite your wondrous imagination – you bleed for your art. That’s the price of art. It’s always been so. Only by believing, then by constantly searching and producing and selecting and refining, do you validate your gift; you remind yourself that inspiration is all around you, that you create, that that is your calling, that you cannot wait for the muse, that you must be the muse. Joseph Éamon Cummins, award-winning writer, taught creative writing and psychology for ten years. 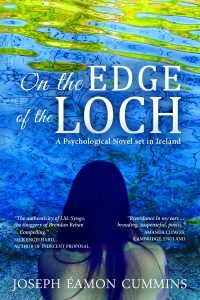 His critically-acclaimed new novel, On the Edge of the Loch: A Psychological Novel set in Ireland, broke into the Amazon Top 20 (British and Irish literature category) at #13 – http://amzn.to/28XNYT6.